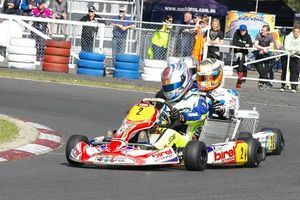 Round Three KZ2 Series Held at the Bunbury City Kart Club 22nd – 23rd July. 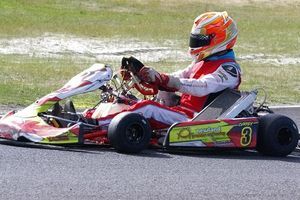 Klarich takes round 2 in KZ2 in torrential conditions at the Dapco Eaton Coastal Classic. 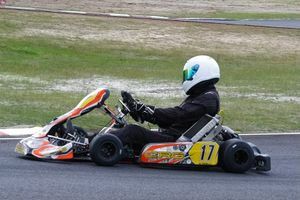 Once again the Bunbury City Kart club track made for close and exciting racing, mix in some torrential rain half way through the final, some slick tyres and you have a recipe for ‘Hectic’ KZ action. 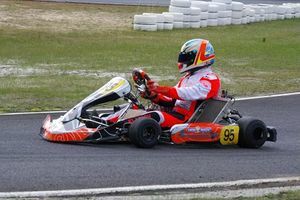 Josh Merritt added to his form this year taking his first KZ2 pole position edging out Jake Klarich and Alexander Barboutis by less than a tenth of a second. As a sign of things to come close racing was expected. It would be Rookie Alex Barboutis to take first blood. Dominating heat 1 from start to finish. Last year’s champion Daniel Currey had a great start up into 3rd and passed Josh Merritt for 2nd in the closing stages of the race. Klarich would then strike back in heat 2 skipping away to control the race early. Klarich is trying to make up for a dismal first round where he gathered barely any championship points. Race wins and race finishes should ensure he challenges for the title. I t will be that much harder however after mechanical failure meant he had to park his Luxor on lap 9. Much to the delight of Josh Merritt, who made the most of the situation taking the win. 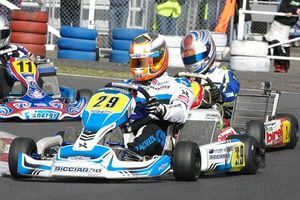 Currey and Barboutis had a good fight going for the 2nd placing, however, Currey took control with 5 laps to go. Barboutis took the early lead in the Pre final before Currey made a pass and took the race win. Barboutis got a comfortable 2nd. Meanwhile, Klarich coming from last had a great drive passing Peter Newland in the dying stages to take 3rd spot. Barboutis again took an early lead in the final, unfortunately, he wasn’t able to hold on and lost 4 spots on the 3rd lap and eventually falling back to the pack to 9th. Championship leader Daniel Currey took the race lead if only for 4 laps before Klarich stormed through to recover from his DNF in the 2nd heat. Peter Newland had made his way into 3rd and looking set to take a podium position. Then the rain came… torrential rain. On lap 13 the tight twisty track was turned into a swimming pool with karts struggling on the slick tyres. Adapting best to the conditions was Dean Whittome who by lap 20 had joined the fight for 3rd with Hayden Patrizi and Newland. Patrizi. He made a mistake to drop off the track but and eventually made it back to the circuit. Whittome made his way into 3rd with 3 laps to go. Klarich was able to take the saturated race win followed by Dan Currey. The fight for the championship is still anyone’s. Currey has a commanding lead but a couple of bad races could quickly turn that round. Rookie Barboutis has moved up to 2nd and is showing consistently good form. Josh Merritt also moves up as Hayden Patrizi drops out of the top 3 after a struggling for pace over the weekend. Qualifying was super close, the closest I’ve ever seen! 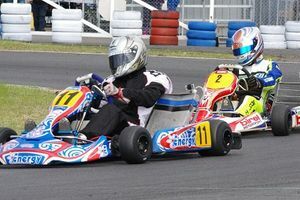 I missed out on pole by 2 hundredths of a second, the track was quite greasy after all of the rain from Friday night which changed it all up, I was still happy to be starting on the front row. Race 1 I ended up 4th. A good launch from everyone in the top 4 made it a good battle in the first few corners but I lost a bit of ground on the front runners. Sat 4th for the whole race and got into a good rhythm to conserve the tyres. Race 2 I got into the lead straight away and led the way for 10 laps before my sprocket came loose and twisted my axle resulting in a DNF. Did a lot of damage and we had to actually cut the axle out of the kart. 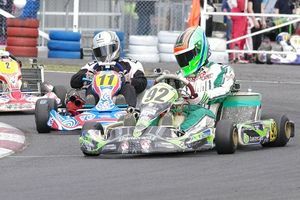 In the Pre final I started in 10th place after the DNF, the kart was super hooked up and I ended up finishing in 3rd place setting the fastest lap along the way. I had some good hard battles along through the race which made it really enjoyable, felt really confident in the kart for the final! The Final was insane. It was a good battle in the first few laps before I made it into the lead on lap 7. I made a bit of a gap to Currey before on lap 13 it started to rain, 3 laps later it rained so hard and we were all out there on slicks. It made it very interesting….I managed to pull a big gap on the field over a few laps which gave me some breathing space 5 laps from home. It was a relief to see that chequered flag that’s for sure, very easy to make a small mistake and drive off of the track! A great experience, it was definitely one of the coolest races I’ve ever been in! Awesome to get the win and hopefully close that gap to the leaders in the championship a bit more. 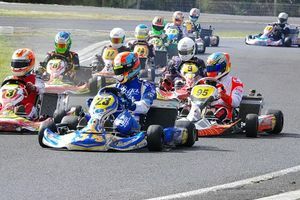 The next round heads to the Albany City Kart Club on the week-end of the 26th and 27th August. The West Australian KZ Committee….